I loved Bonfire Night growing up. It was one of my favourite nights of the year. Each year we would have a BBQ and fireworks party. My Uncle Andrew would always buy us a huge rocket which we would save for the end. Bonfire Night was always my Grandad’s birthday party. 3 years ago today, on his 81st birthday, my lovely Grandad died. It was so unexpected and I was devastated. Grandad had old people things wrong with him, but nothing that would’ve predicted his imminent death. It was a Monday. I had a phone call at 6.00am to tell me he had been found downstairs. He’d never even made it to bed. We were assured it was peaceful. Each Sunday, always, the Villars’ family have tea together at my Grandparents house. The day before Grandad’s birthday in 2007, I didn’t think I was going to make it. My car had broken down and wasn’t fit to be on the road. I think if I remember correctly our head gasket had gone. We only had the one car back then. I remember being upset because it was the day before Grandad’s birthday and really wanting to get there. I was determined we were going to get there. Why? Usually I would’ve just phoned and said I’d make it up tomorrow or whatever. But this day, we were going, in the broken down car whatever damage it was doing to it. I feel now, I was meant to get there that day – to see my Grandad before he died. It is that that gives me comfort. I would never have forgiven myself if I hadn’t made that last Sunday tea. The night before Grandad’s funeral we went to see him in the chapel of rest at the funeral home. His was the first body I’d seen. In hindsight, it wasn’t a great idea. He didn’t look like him. Only a wax-like version. I came away and had nightmares for weeks. Sleeping with the light on. Bonfire Night has never been the same since. We’ve not had a family fireworks party since his death. It makes me sad, I miss it. The photo of my Grandad was taken on his 80th Birthday – my favourite picture of all, because I believe it captures a part of Grandads essence. 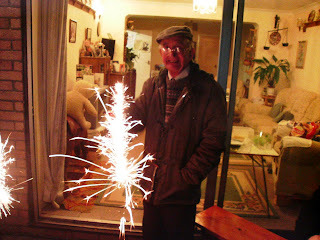 His fireworks, his birthday. When Grandad died we were planning our wedding. I was devastated my Grandad would not see me get married, because I know he would’ve been proud. 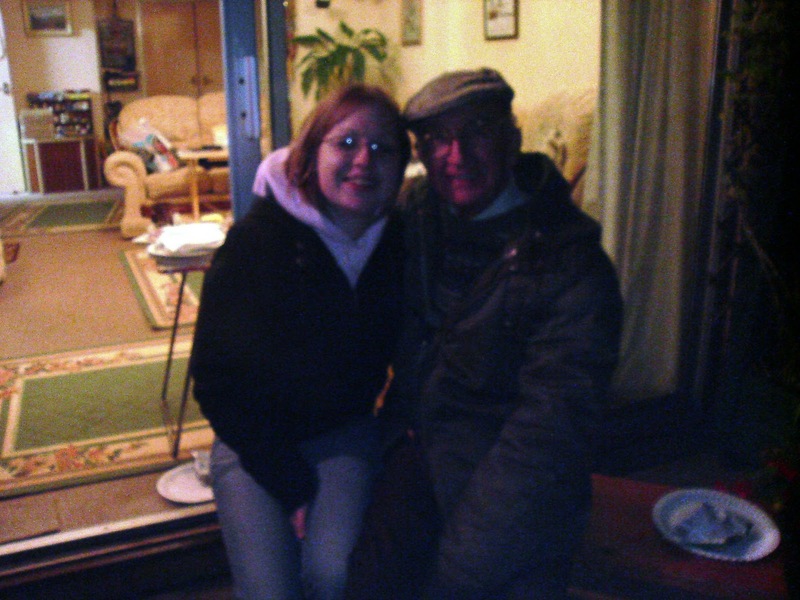 But in my heart a part of my Grandad was always going to be there. We hired a professional fireworks company to do a short display in the evening; it wasn’t to be showy, it was in memory of my Grandad. I cried throughout them. The missing never stops does it. I was upset again when we found out we were pregnant with Anabelle and that he was missing his first great-grandchild. Another milestone in my life. Grandad was a family man, a generous man. He loved and adored his grandchildren and made no secret of it. He would’ve adored Anabelle. And yet, when Anabelle grew her wings, I realised that in heaven, my Grandad will be adoring my Anabelle. He will be in his element looking after his two grandchildren who are with him there. We wrote a letter to Anabelle and left it with her before she was buried. I finished this letter by telling her to stay close to her Great-Grandad because he would love her and spoil her until Mummy and Daddy were with her too one day. If she can’t be with me, then it comforts me to know someone who will really love her too is there. It is rituals of remembrance that make these anniversary days more bearable. The routine, so we know what to expect. In a little while, as I’ve done each year since on Grandad’s birthday, I will go to the cemetery and light sparklers for him. It is now mine and Grandad’s little annual thing. The essence of his birthday. Today for the first time, I will also light sparklers in Anabelle’s garden. Giving her, her first experience of fireworks, the first time her name will be written with a sparkler. And as we stand there and think of them both, I’ll imagine her being held in her Great-Grandfathers arms and knowing how much all of her family love her. And now this story has a comical ending! Tonight we got locked in the cemetery! Anabelle obviously thought it was a funny game to play on Mummy and Daddy! We finished the sparklers at about 5.25 and made our way to the gates (cemetery closes at 5.30! ), we got to the gates at 5.26 and could see the man had just locked up and got back in his van. Jon flashed the lights at him 3 TIMES but he drove off! So there we are locked inside. He must've seen us! and we were there before gates were supposed to be locked too. My first reaction was to cry! But I think it is really funny now, and that my girl is a little minx! We had to ring the emergency council number and sit there for 45 minutes waiting for them to send someone out to us to let us out! Memorable first bonfire night with Belle!